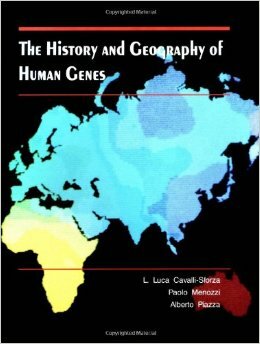 A friend of mine proudly told me recently that she’d purchased an unabridged edition of The History and Geography of Human Genes. Turns out that there are some affordable used copies floating around (under $50, like the Atari 2600!). Flipping through the old unabridged edition I had to admit: a lot of the assertions derived from classical autosomal markers hold true. It might be that all you really need to get “up to speed” is an annotated version. 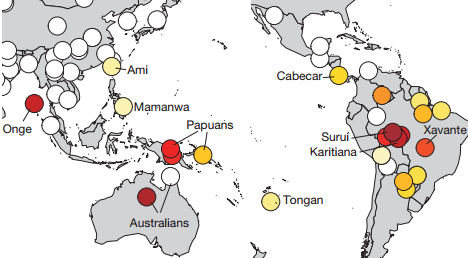 Also, I’d get rid of the synthetic maps, which no one uses anymore (there are some methodological reasons, as well as the fact that they just didn’t turn out to be a very intelligible visualization). 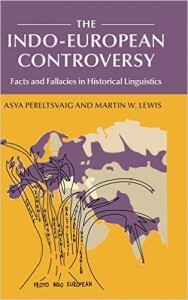 Been reading The Indo-European Controversy: Facts and Fallacies in Historical Linguistics, by Asya Pereltsvaig and Martin Lewis. To a great extent it is a book length response to the research program which made such a big splash with the 2003 Nature paper, Language-tree divergence times support the Anatolian theory of Indo-European origin. I’m over half-way through. 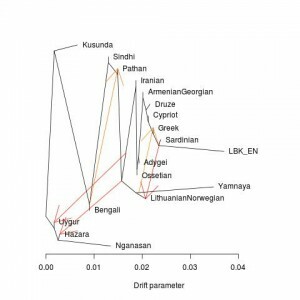 Some of it has been hard going, as I’m not very familiar with the details of linguistic science (I get very confused when linguists start using technical terminology for accent changes; anything beyond diphthong). 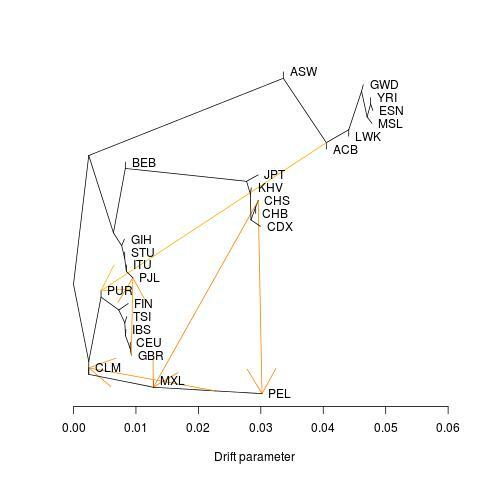 On the other hand, I know a decent amount about the nuts and bolts of Bayesian phylogenetics, and their critiques are cogent so far. To be fair I’m broadly sympathetic to Pereltsvaig and Lewis’ program. 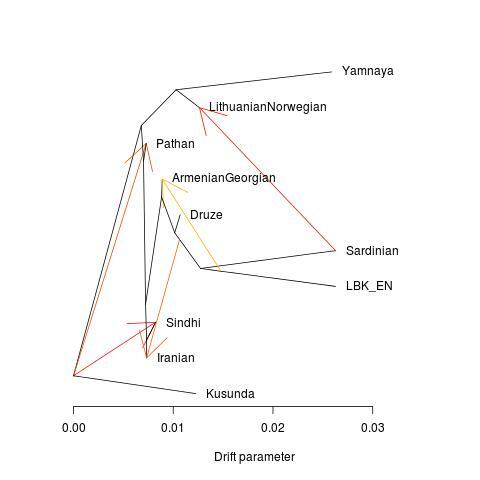 There are a decent number of references to genetics in the work, though it looks like they were in final revisions before Massive migration from the steppe is a source for Indo-European languages in Europe. 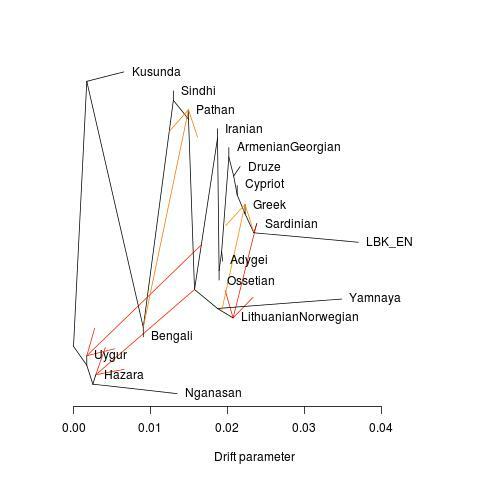 But even without the genetics, I think the case is pretty strong that a simple version of Colin Renfrew’s Anatolian demic diffusion doesn’t work. 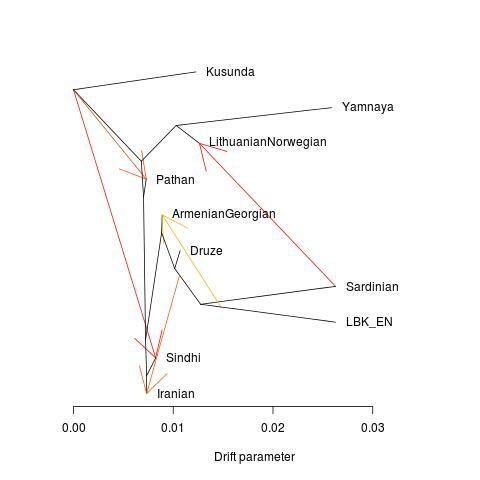 The contortions necessary to make it plausible in Anatolia during the Bronze Age are too implausible. 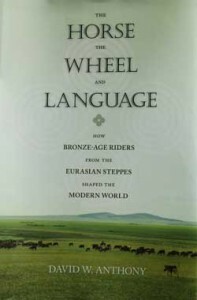 If The Indo-European Controversy is a bit too technical, I do recommend everyone check out The Horse, the Wheel, and Language: How Bronze-Age Riders from the Eurasian Steppes Shaped the Modern World. David Anthony’s work is probably a lot more relevant today because of the findings from genetics. Even if a Steppe-only model can’t explain everything, evidence of massive population replacement in Northern Europe really does overturn any naive idea that Germanic languages somehow derive from the LBK culture…. William Dalrymple in The New Yorker has a reflection up on the 1947 partition of the subcontinent, The Great Divide. It is fine so far as it goes. He reminds us of the scale of the tragedy, millions of deaths, as well as the depravity of the barbarity, as “infants were found literally roasted on spits.” Some day I will have to educate myself about this period, as I only have vague recollections of reading fragments of Freedom at Midnight as a child. I recall stopping at the point where the authors reported how a group of men broke into an obstetrics unit at a hospital and took a newborn who had just breathed their first and smashed its brains out on the walls, while the mother and hospital staff watched in horror. That was enough to get a flavor of the “action.” Fortunately my family did not suffer during this period, Bengal was relatively quiet in comparison to the atrocities washing over Punjab (as many of you are aware, my family experienced more hardship in the 1971 war, though as they were relatively privileged Muslims who were also not very involved in the arts or politics they were not actively targeted). Ten years ago I read Nicholas Dirks’ Castes of Mind. It is a work of history which shows how many caste identities were fashioned de novo under the impetus of British bureaucratic taxonomic impulse (see Census of 1891). Though Dirks is too subtle to assert that the caste system was created by the British, the general thrust of the work is clearly one which emphasizes the role of recent historical contingency in establishing the social order of South Asia as we understand it. The subhead is after all: “Colonialism and the Making of Modern India.” The British are then the agents who operate upon the formless void of the Indian subcontinent’s amorphous peasant culture. They came, they saw, and they created. Even when I read Castes of Mind I was moderately skeptical of the narrative, as there had been enough genetics done to suggest that South Asian populations were stratified by caste. 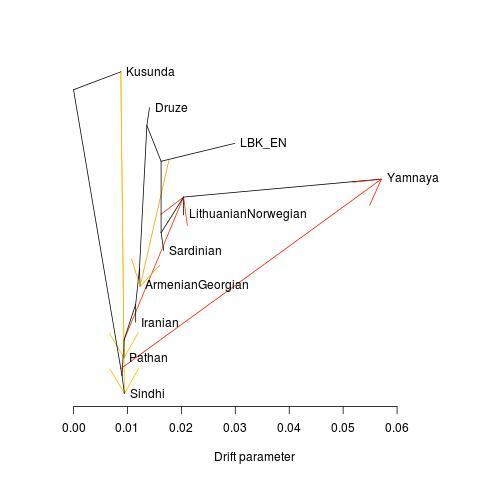 By this, I mean that caste status as much, or more, than geography predict the genetic structure of Indian society. 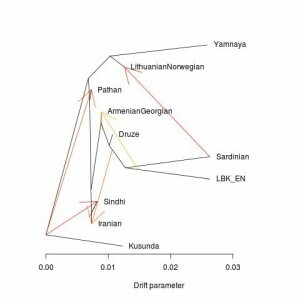 It was already evident, for example, that South Indian Brahmins were closer to North Indian Brahmins than they were to South Indian Dalits when it came to genetic relatedness. Brahmins and Dalits are two caste groups which are clear and present throughout South Asia (the “middle castes” tend to vary from region to region, and the classical warrior and trader castes do not exist in South India, though there are notionally Sudra groups which occupy their roles). Even those who prioritize the role of the British would accept that the Brahmin and untouchable categories predate the reification of the colonial period. 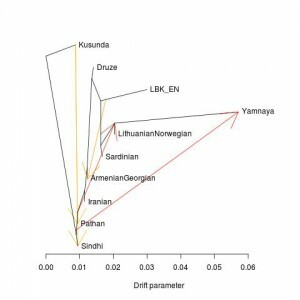 But what the latest genetics is telling us is that caste endogamy has been a feature of Indian life for at least 2,000 years, and perhaps longer. Not only are Brahmins distinct from Dalits, but castes with a less clear position in the classical varna typology, such as the Reddy community of South India, clearly have had long histories as a coherent groups. The British could not have been the dominant causal force in shaping caste as a ubiquitous feature of Indian life if they were already genetically endogamous even before the Muslims arrived. And so with religion. 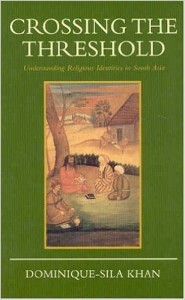 The contemporary revisionism, which now is approaching mainstream orthodoxy, is that South Asian religious life before the arrival of the British, and the Western outlook more generally, was characterized by a quietist syncretism where communal boundaries were fluid to the point of confessional identity being a flimsy veil which could be shed or shifted dependent upon context. An alternative history then might be proposed of a united subcontinent, where Hindus and Muslims were coexistent, or, perhaps where a Hindu and Muslim identity did not even exist. The cognitive psychologist Pascal Boyer likes to characterize a theory as giving you “information for free.” You don’t really have to know anything, you can simply deduce from your axioms. 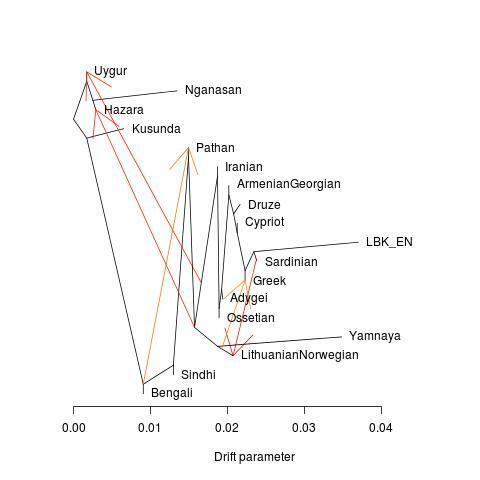 Though the model of South Asian ethno-religious history I allude to above obviously integrates ethnographic and historical realities, it constructs a post-colonial fantasy-land, where South Asian religiosity was without form or edge before the arrival of Europeans and their gaze collapsed the wave function. Before the instigation of Europeans people of color were tolerant of religious diversity, varied sexual orientations, and practiced gender egalitarianism. In other words, India was like the campus of Oberlin college, except without the microaggressions, and more authentic spirituality! 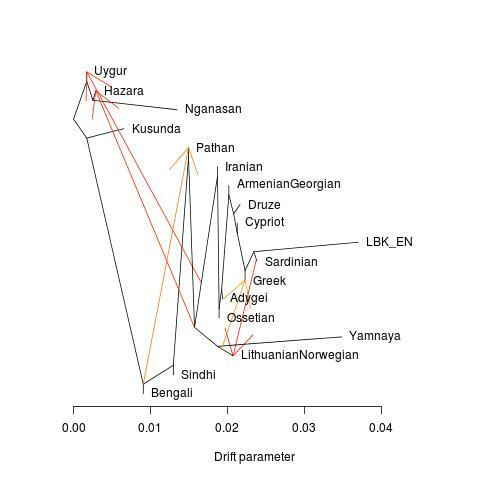 The first problem with this model is empirical and specific to South Asia. 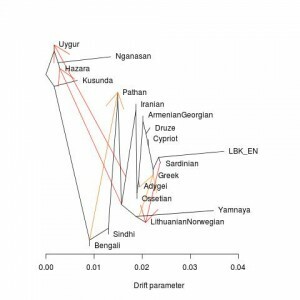 Before white Europeans arrived in the Indian subcontinent to roil and upend its social order, to transform its culture, there was already a ruling race of self-consciously white people doing just that. They were the Turks, Persians, and a lesser extent Arabs, who introduced Islam to the subcontinent. As alluded to in Dalyrmple’s piece in some ways Islam was conceived of as a sect of the foreigners by the natives, as well as the Muslims themselves. This is not an entirely strange state of affairs, in the first century or so of Islam the religion was the tribal cult of the Arab ruling caste of the Caliphate. 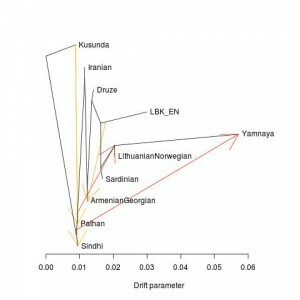 Only with the rise of the Abassids and maturation of Islamic civilization as a pan-ethnic and post-ethnic dispensation did the “converted peoples,” in particular the Persians and Turks, become full members of the Ummah, and turn it into the universal religion that we understand it today (though even today there is an ethnic dimension in Islam, for example, the Islamic State accepts that the Caliph must be an Arab of the Quraysh tribe). 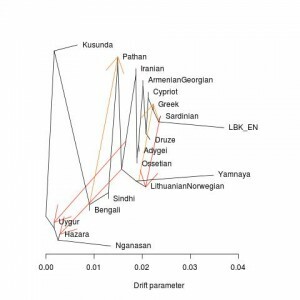 For many centuries Islam in South Asia recapitulated this pattern ancient pattern, whereby those who descended from converts were received as second class citizens (and still called “Hindus,” which simply meant a native of Hindustan). And to this reality must be added the dimension of race, for the Muslims from the west viewed the native peoples as black, and many elite families with origins in Persia and Central Asia maintained their endogamy for generations partly as a matter of racial hygiene. When Muslim elites did intermarry with the descendants of converts, it was invariably with those descended from high caste groups. The Mughal Emperors did wed women from Hindu backgrounds, but these were the daughters of powerful Rajputs, whose values and armies fused with the Muslim invaders to create what we understand as Islamicate civilization. Yet there are many other stories besides the standard one of the rise and fall of Mughal India. In Crossing the Threshold: Understanding Religious Identities in South Asia, the author shows how the arrival of Islam in the subcontinent often involved a complex process of cultural interaction mediated by esoteric strains of the Ismaili sect. It is not relevant for the purpose of this post to review the nature of Ismaili Islam, but it is important to note that Sunnis view this group as deviant and marginally Muslim. With the arrival of the Mughals there began a long period of persecution of Ismailis in the Indian subcontinent as the new arrivals attempted to enforce conformity on the Muslim population. 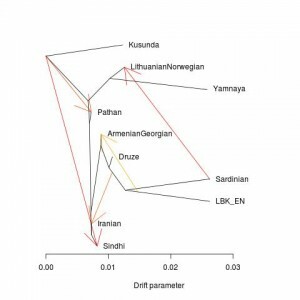 Both Crossing the Threshold and Mullahs on the Mainframe, an ethnography of a particular Ismaili sect in Gujarat, report that many of the Sunni Muslim communities of the subcontinent may be descended from people who entered Islam via Ismailism. Under the Mughals heterodox Muslim sects like the Ismailis were subject to more persecution than non-Muslims (this echos a similar dynamic in Late Antiquity, where more of the Christian animus was directed toward heretical sects than pagans). In Gujarat this resulted in mass conversions to Sunni Islam. 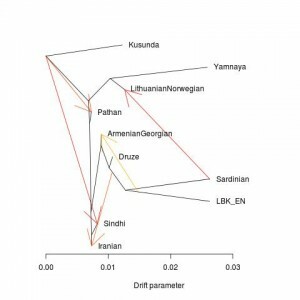 In other regions it might have resulted in a “compromise” state of shifting to a Twelver Shia identity, which though not Sunni, was generally accorded more respectability than Ismailism. These people would be anticipating the life of Muhammad Ali Jinnah, whose recent ancestors (most accounts state his grandfather) converted from Hinduism to Ismailism, but who himself was an entirely irreligious man who avowed a Twelver Shia faith for purposes of formality. The author of Crossing the Threshold suggests that for many centuries there existed in the subcontinent under the more tenuous and patchwork pre-Mughal Islamic rulers many liminal communities, which straddled the line between Muslim and Hindu. 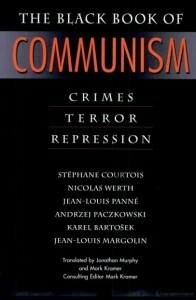 So long as the Muslims of the Indian subcontinent viewed themselves as strangers in a land which offered them opportunities for profit, there was a certain freedom in being viewed as an amorphous black-skinned mass of “Hindus” whose only importance was in the tax that they provided their overlords. The Mughals changed that. Though they were in origin Timurid princes from Central Asia, their long ascendancy in the subcontinent produced a genuine synthesis with the indigenous substrate. 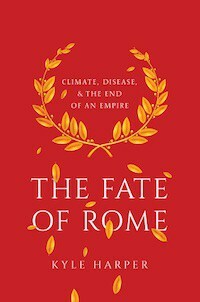 By the later years of the dynasty their symbolic and ceremonial roles as Emperors of India became so entrenched that even resurgent Hindu groups such as the Marathas retained the Mughals as figureheads, much as the Zhou dynasty persisted for centuries after its genuine preeminence had faded. Over the 150 years that the Mughals dominated South Asia with their armies they also changed the nature of Islam in the subcontinent thanks to their broader connections. The Naqshbandi Sufi ordered was associated with the dynasty, and objected when rulers such as Akbar bent or rejected what they perceived to be Sunni Islamic orthodoxy. And the Naqshbandi were in a place to judge what was orthodox, as they were an international order with branches across Sunni the Muslim world. The historian S. A. M. Adshead discusses the role of what he calls the “Naqshbandi International” in binding the Islamic world back together after the shattering of the Mongol invasions in Central Asia in World History. It was no coincidence that attempted to root out deviancy and enforce what they saw to be uprightness. China was another zone of Naqshbandi influence. Unlike India China proper had (and has) never been ruled by Muslims. After period of prominence under the Yuan (Mongols) the Muslim groups became another minority, tolerated by the Han Chinese, but viewed with curiosity and confusion. While the Muslims of what is today called Xinjiang were part of the Turkic world, and even when conquered by the Manchus administered as a separate domain from China, those resident in the east were relatively isolated from the Ummah, and swam in a Han sea. 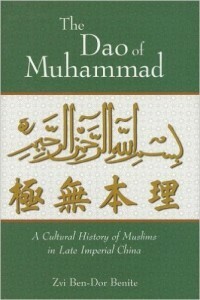 The Dao of Muhammad: A Cultural History of Muslims in Late Imperial China tells the story of the intellectuals among the Muslims of eastern China, who were confronted with accommodating the reality that they existed at the sufferance of non-Muslims, and could only advance to prominence and prosperity playing the game according to the rules of the Han majority. At the popular level in places like Ningxia there emerged Muslim apocalyptic movements which bore a striking resemblance to heterodox variants of Pure Land Buddhism, but among the intellectuals there arose the conundrum of how to render compatible orthodox Islam and Neo-Confucianism. So long as China was reasonably isolated from the rest of the world, this process dynamic proceeded without interference and followed its own logic. What emerged can reasonably be described as a synthesis between Islam and Neo-Confucianism, which resembles in its broad outlines the sort of fusion which occurred in early Christianity after the ruling elites took up the religion and imparted upon it their own philosophical presumptions. Just as some Christians perceived in their religion the completion of the project of the ancient Greek philosophers, so Hui Muslim intellectuals in the cities of eastern China in the 18th century saw in Islam not the overturning of Chinese culture, but its extension and perfection. Suffice it say this movement among educated Chinese Muslims did not give fruit to a vital modern tradition. Several waves of Islamic reform have blasted into China from the outside world, first from Central Asia, and later from the Middle East proper in the age of modern transport and pilgrimage. 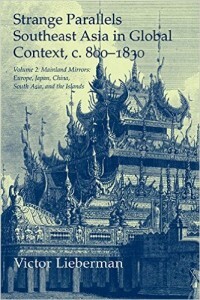 The Islamic-Confucian synthesis in its full elaboration was a stillborn sect, pushed aside by the popularity of world normative Islam and the decline in prestige in the 19th and 20th century of Neo-Confucianism. Similarly, the Islamic-Hindu synthesis championed by the Mughal prince Dara Shikoh and prefigured by his great-grandfather Akbar, was forestalled by the emergence of Aurangzeb. Remembered as pious and steadfast by many modern day Muslims, he is reviled by Hindus, and most Western historians, who perceive that the sun set on religious pluralism due to his actions, seem to take a dim view of him. But Aurangzeb was closely associated with the Naqshbandi over much of his life, and he may be less important to the broad social movement of South Asian Muslims being drawn into an international system, with a standard set of beliefs and practices, than we think. Rather, Aurangzeb’s life arc may be consonant with both the indigenization of Islam in the subcontinent, and its need to align itself with external norms. 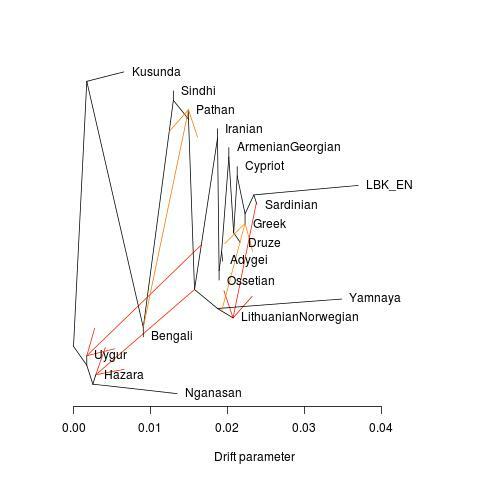 Though I use the Indian subcontinent as my primary illustration, the dynamic is likely more general. 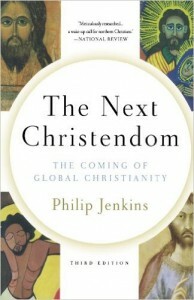 In The Next Christendom: The Coming of Global Christianity Phillip Jenkins notes that though many claims are made for indigenous African churches, that is, those which have no connection to global denominations and movements and tend to more freely integrate African practices, as African societies become more Christianized they tend to become more mainstream and orthodox in their affiliation. What Jenkins is observing is that with development and modernity indigenous and local practices tend to fade into the background, as African Christians become influenced by the ideas and traditions of Christians from other regions of the world. Individuals who consider themselves part of a religious community start to adhere to the practices and norms of that community’s history. Despite the homogenization and delineation of identity categories in India there are still liminal communities in the mode envisaged by Crossing the Threshold. The Meo people of Northwest India are Muslims who maintain many Hindu traditions. But the trend among the Meo is to become progressively “more Muslim,” and those Meo who leave their homeland assimilate into the conventional Sunni Muslim milieu and lose their distinctiveness. The Ismaili Khoja community of India is another example of a Muslim group with many Hindu customs and beliefs which has become more “orthodox” within historical memory. In this case the arrival of their spiritual leader, the Aga Khan, from Iran in the 19th century seems to have triggered an Islamic reformation of views and mores. And just as there may have been many groups which moved toward a more standard Muslim identity, there were likely those who became more self-conscious in their Hinduism, as that tradition coalesced as a negation of the exclusive confessionalism of Islam. The Hussaini Brahmins customarily participated in Shia Ashura, and have an origin story which places them at Karbala on the side of the sons of Ali. As noted above it was not unknown for high caste Hindus to enter Islam and intermarry with the Muslim nobility. Over time their Hindu origins may have been obscured, as they constructed wholly Muslim origin narratives. The Hussaini Brahmin community might illustrate a case where the process was halted, and reversed, albeit with a retention of some of their Islamic practices and beliefs. In Crossing the Threshold the argument is made that it the critical aspect for the Sunni Muslim eminences enforcing the new orthodoxy was that Muslim and non-Muslim be clear and distinct categories. Therefore, better a Hindu than a heretic. What have I left out of the story? Note that white Europeans are notably absent from the narrative. To some extent this is an artificiality. European “factories” were present on the margins of Mughal India. Jesuits supplanted Muslims as astronomers in the court of Ming China, and were disputants on religious topics in the court of Akbar the Great. Christianity, Islam, and Buddhism, were all closely associated with each other in Central Asia, to the point where it is difficult to tease apart the arrows of causality. In China it seems likely that some varieties of Christianity with ultimate roots in Persia and Central Asia were subsumed into strands of Pure Land Buddhism. 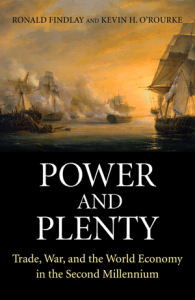 But, the point is that history and peoples are subject to general patterns and dynamics, and European colonialism may be thought of as just one important contingent factor. A critical one, but one factor nonetheless. It is hard to deny the influence of European culture and Christianity on Indian national and religious worldviews. Consider Hindutva. 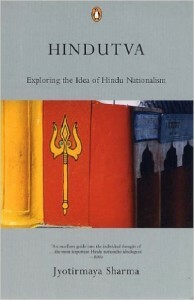 Conceived of as a form of Hindu racial nationalism by Vinayak Savarkar, himself an atheist who advocated the dismantling the caste system, it is difficult to understand it without considering the dominant winds of culture in the early 20th century. Those winds invariably blew out of Europe. The colonial imprint, the mirrored reflection of British racial nationalism, is real. Today the intellectual descendants of Savarkar promote bizarre beliefs like the idea that ancient Hindus had flying machines and nuclear weapons, and that astrology is a true science and Ayuvedic medicine is superior to that of the West. It is hard not to see in these beliefs a funhouse distortion of Western movements, such as Christian Science and Creationism. Similarly, the Islamic Creationism of Harun Yahya is explicitly indebted to American evangelical Protestants! And yet within South Asia the broad trend of confessionalization predates the arrival and dominance of Europeans. 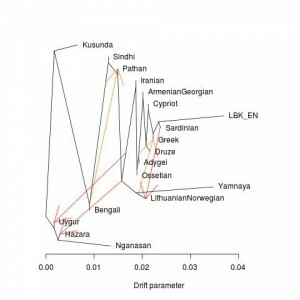 It seems entirely likely that a division between Islam and what became Hinduism in the subcontinent was inevitable, as modernity and globalization seem to produce crisper identity groups, which are not diffuse, inchoate, and locally rooted. Yes, illiterate peasant naturally practice syncretistic traditions, but when the illiterate peasant becomes a town dweller a different sort of religious practice takes hold. There is a reason that the city-dwelling Christians of the Late Antique world were contemptuous of the marginally Christianized peasantry, the pagani. The last European people to convert to Christianity were the Lithuanians, in the late 14th century. But the peasantry retained enough of their customary religion that veneration and recollection of sacred groves seem to have persisted down to early modernity. 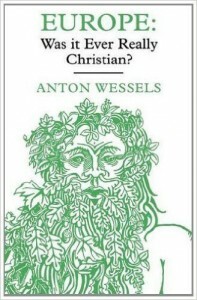 The Reformed Dutch scholar Atonie Wessels wrote a book titled Europe: Was it Ever Really Christian? His thesis is that from an orthodox Protestant perspective which privileges the beliefs and practices of the individual, it can be argued that much of the European peasantry was operationally pagan down to the Catholic and Protestant Reformations of the 16th and 17th century, followed by the secularization of the continent that began after the Peace of Westphalia. In short, during the period after the fall of Rome and Renaissance the elites were steadfastly Christian, but peasants were only nominally so, with their spiritual life dominated by superstitions rooted in local traditions. In contrast, the emergence of Protestant and Catholic identities during the Reformation resulted in a broad based Christian feeling and identity among the populace. So much so that when the Hohenzollerns converted to Calvinism in the early 17th century their subjects remained steadfast in their Lutheranism. But as the populace became more conventionally Christian, the elites began their long slide toward secularism, finally resulting the rise to power of Frederick the Great, who in matters of religion was apathetic at best. The European example is important, because it shows that even without exogenous European colonialism confessionalism occurs as a society modernizes. The seeds of this confessionalization are clear in South Asia even before the rise to power of the British raj, as Hindu rulers such as Shivaji privileged their own native traditions as against that of the Muslims, while earlier the rulers of Vijayanagar had served as patrons of native religion while the north of the subcontinent was dominated by Muslim polities. It does seem fair to state that Sanatani is not comprehensible without it dialectic with Islam. But, it is important to remember that Buddhism as an organized religion with a missionary impulse predates Christianity by centuries. Obviously institutional religious identity in the subcontinent is not dependent upon the ideas of Europeans and Muslims. What differed with the arrival of Islam is that it was a Weltanschauung which was not digestible to the native cultural traditions. Though the various Muslim ruling warrior castes held themselves aloof from the people of India, being within the subcontinent, but not of it, it seems inevitable they presumed that their domains were now a permanent part of the Dar-ul-Islam, just as Iran or Central Asia was. Certainly Ibn Battuta could travel in an entirely Muslim India, which operated in parallel with the practices of the vast majority. Over time no doubt the Muslims assumed that the subcontinent would be won over as Iran had. It is hard to remember now, but in the first few centuries of Islamic rule there were periodic anti-Muslim nativist religious eruptions which attempted to overthrow the Muslims, who were perceived as aliens. Prophets arose which told of a time when Islam would fall, and the old religion of the Iranians would come back to the pride of place that it had had. 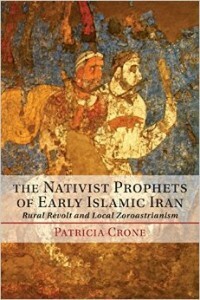 A detailed exploration of this lost world can be found in Patricia Crone’s The Nativist Prophets of Early Islamic Iran, but these movements always make cameos in even traditional works of early Islamic history, such as Hugh Kennedy’s When Baghdad Ruled the Muslim World. 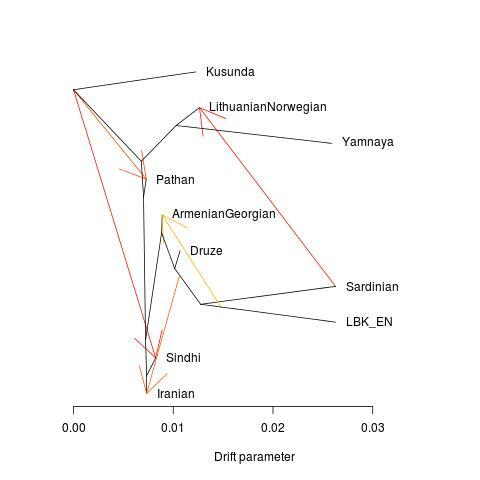 But by 1000 A.D. the majority of Persian peasants were Muslim, and Zoroastrianism and its affiliated movements slowly went into their long decline (though still retaining influence through various heterodox Islamic and post-Islamic religious movements). In India you have a world where the vision of the Iranian prophets came to be, where Islam which seemed eternal and ever waxing in numbers and influence, lost its hold on power and native dynasties which championed local religious traditions arose. There are many differences between the situation of Iran and India. In no particular order, India is far more populous than Iran, local non-Muslim rulers always managed to retain independence at the far corners even at the height of Islamic power and dominion, and the cultural distance between the Muslims and the natives of India was arguably greater than that between the Arabs and the Persians. 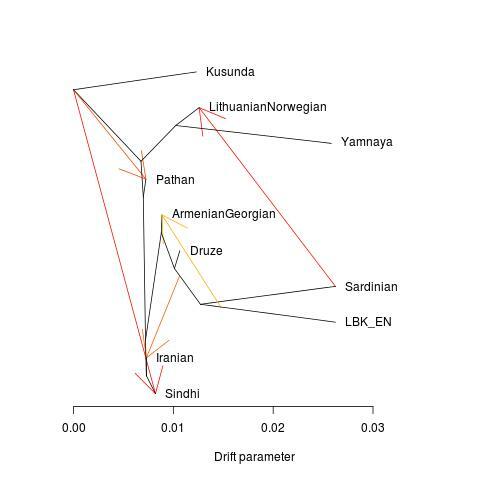 Even though the Iranians and northern Indians share Aryan cultural roots and influence, reflected in language and religious ideas, those are distant affinities. In contrast, the Arabs had long been present on the margins of the western Iranian world, and the ecology of much of Iran and Mesopotamia was familiar to them. One peculiarity of the historiography of India under the Muslims is that many scholars claim that local intellectuals, mostly Brahmins, behaved as if their conquerors did not even exist. This sort of involution though may be less strange than seems on first inspection. Ashkenazi Jews in Central and Eastern Europe are to a great extent a people without a history, as their intellectual class devoted its energies to Talmudic commentary, not recording the history of their people. India was massive, and transformations were pregnant within its cultural matrix in response to the Islamic challenge. The Sikh religion seems an obvious case of synthesis, which while that of Hindu reformist movements such as Arya Samaj seem to sublimate the external variables. Though the British may have been a proximate cause for the communal conflicts that tore apart the subcontinent in 1947, they were not the deep cause. 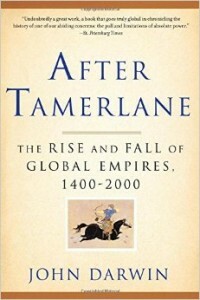 As Victor Lieberman observes in Strange Parallels: Europe, Japan, China, South Asia, and the Islands, after 1000 AD there arose several polities dominated by cultural aliens along the edge of Eurasia, such as that of the Muslims in India, the Tai in Southeast Asia and the Manchu in China. But unlike the latter two cases the Islamic elites never sufficiently rooted themselves in the local culture to establish a coherent and unified national identity. While the Manchu racial sense of distinctiveness persisted down to their overthrow, their cultural assimilation to most Han mores was so total that rulers such as Kangxi Emperor arguably became exemplars of Confucian rulers. Though the Tai imposed their language of the Mon and Khmer people whom they conquered, they fostered a genuine cultural synthesis by patronizing the Theravada Buddhism of their subjects and espousing it as their national religion. 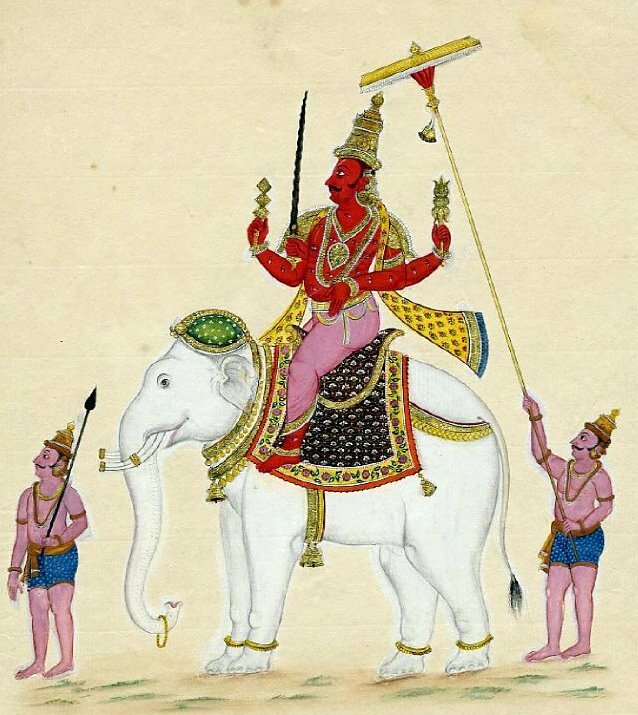 While the kings of Thailand patronized Brahmins to give their rule a tincture of Hindu legitimacy, the Mughals were styling themselves as Padishahs. If Dara Shikoh had defeated Aurangzeb and the British had never brought India into their Empire, would history have been different? I would like to hope so, but I doubt so. Akbar had attempted to create a new religion, but it did not last beyond his life. By the 17th century what was becoming Hinduism, and Indian Islam, were already sufficiently developed that they were becoming cultural attractors. Not through cognitive bias, but the weight of inertia of their cultural history and precedent. The transition from Akbar, to Jahangir, to Shah Jahan, and finally Aurangzeb, is one from an individual who brooked the displeasure of Naqsbhandi shiekhs, to one who worked hand in hand with them. An alternative vision is one where the heirs of Akbar turn their back on their dreams of Fergana, and rely upon Rajputs to dominate their lands instead of a mix of Central Asians and native Indians, Hindu and Muslim. Perhaps the Mughals would have become indigenized enough that they would transform into that they would have become fully Indian in their religious identity. Ultimately the answers of history are more complex than can be dreamt of in your post-colonial philosophy, and the white man is neither angel nor the devil, but a subaltern of historical forces. Posted in Uncategorized125 Comments on Do colored people exist if there are no white people to observe them? 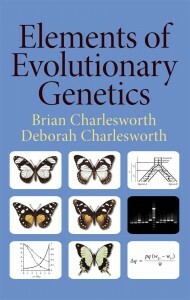 Brian Charlesworth, co-author of the magisterial Elements of Evolutionary Genetics, won the Thomas Hunt Morgan Medal from the Genetics Society of America this year. 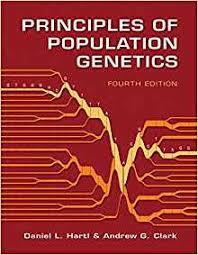 An open access copy of his speech, What Use Population Genetics?, is now online at Genetics. In the speech he makes the case toward a broader audience, which includes people working in molecular and developmental areas far removed from population genetics, as to why his field is important and critical to the broader scholarly enterprise. 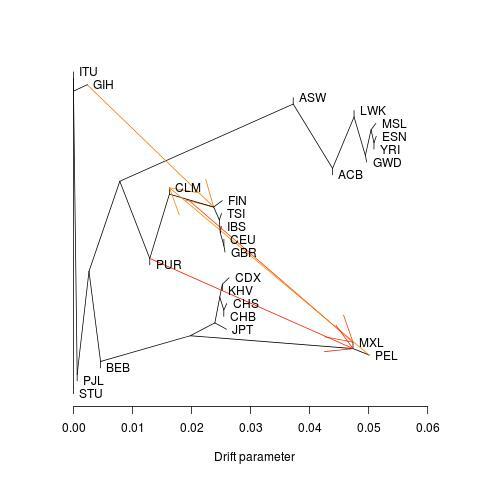 First, he argues that without a good intuition for population genetic dynamics, one can not model evolutionary process very well. 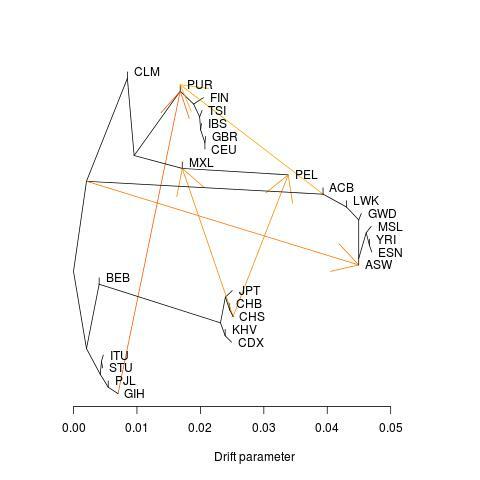 Of course that intuition only comes over time absorbing population genetics and gnawing on problem sets. But you have to put the work in to talk cogently about evolutionary biology in its broadest scope. 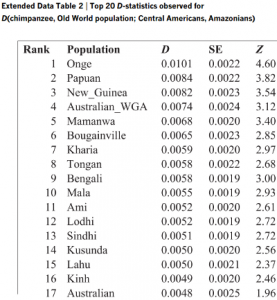 Charlesworth suggests that those who don’t know population genetics “run the risk of making mistakes such as asserting that rapid evolutionary change is most likely to occur in small founder populations.” The issue here is that selection is powerful in very large populations. Not so much in smaller ones. 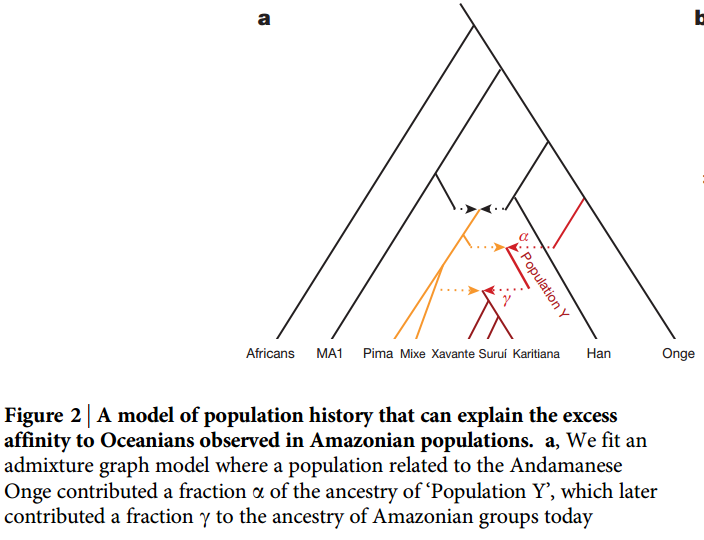 I’ve personally encountered this confusion many times from biologists who are not population geneticists. 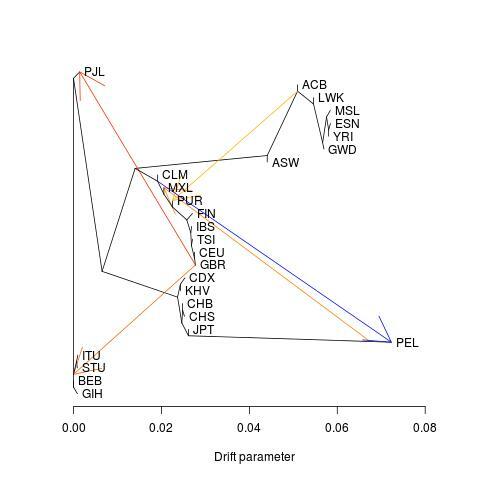 But, I do want to also admit that genetic drift can cause rapid allele frequency changes, so even here I would say that some people might quibble a bit with Charlesworth on the specific details (I am not one to dispute this particular assertion, for the record; I know what he meant). 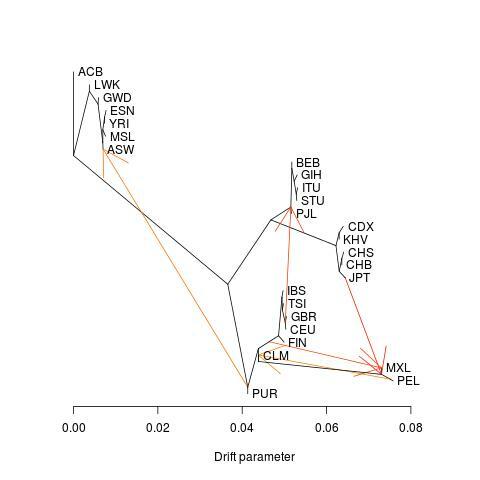 Second, he addresses the nature of transposable elements (TE) in the genomes of organisms, and why they are so common, and where they are so common, as well as the role of PRDM9 in recombination. 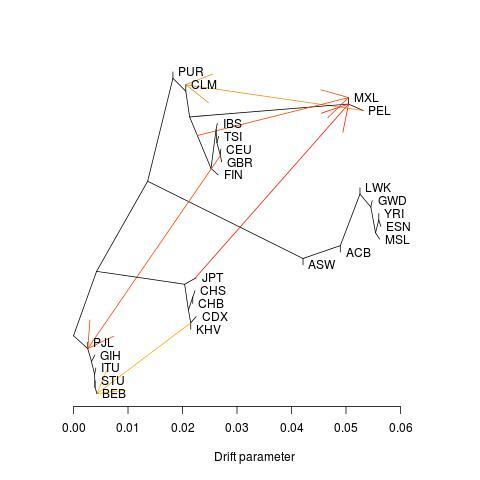 Pervasive features of the genome may, or may not, have adaptive origins. 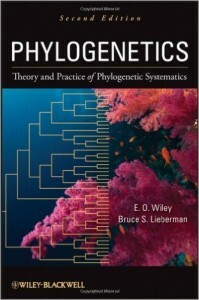 That means evolutionary genetics has to step into the fray and address the long term dynamics. 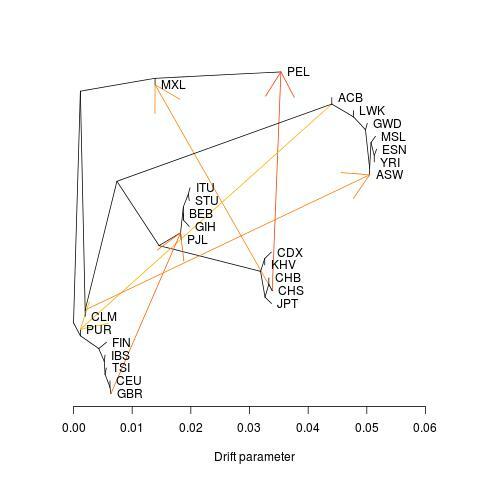 Intersecting the frameworks of evolutionary genetics, and the structural constraints of molecular genetics, Charlesworth illustrates how population genetics sheds light on the biophysical character of genomic features, as well as the distribution of those features. If evolutionary biology is the science of why. 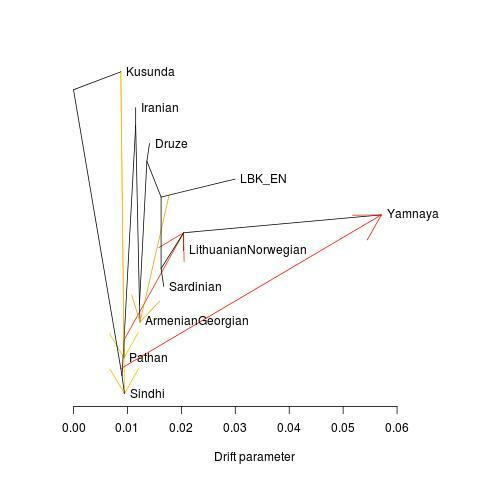 Population genetics is how. 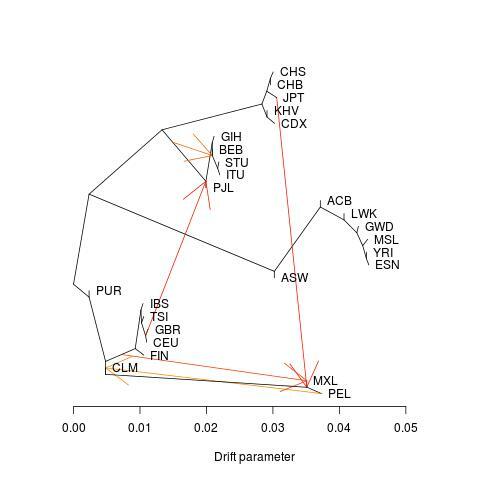 Molecular genetics may be thought of in this schema as the is. 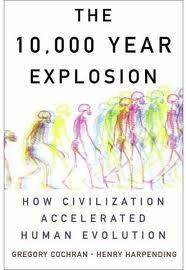 Finally, though Charlesworth alludes to it in passing only at the end of his speech, I think it is critical to remember that the post-genomic era is upon us, and it is incumbent upon us to think in in population terms. 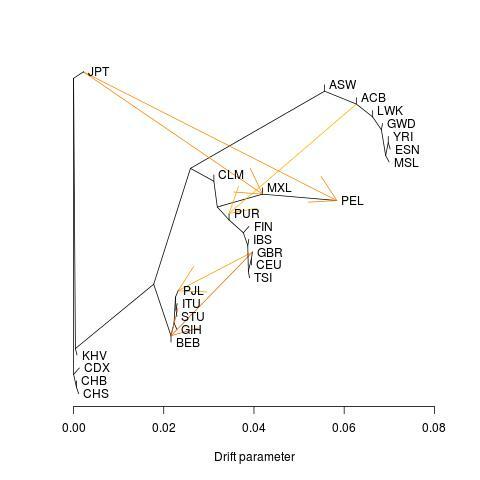 The style of analysis which is common in population genetics lends itself easily to big data analyses. I recall a conversation with a young researcher last year at ASHG where he told he was moving from population, to medical, genetics. And yet when his most recent publication came out I had to observe that it was fundamentally a work of medical population genomics. You can take the geneticist out of the population, but you can’t take the population out of the geneticist. After my post on GMO and its enemies the usual suspects have been on the attack, accusing me of being a shill for Monsanto. 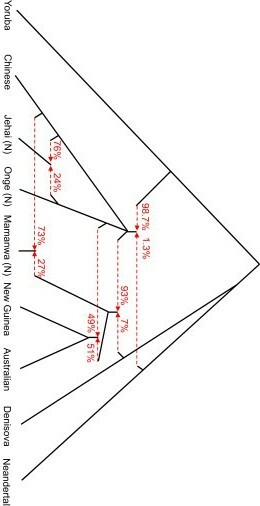 The reality is that I’m a mammalian evolutionary genomicist. I don’t work in applied agricultural genetics, though I have no problem with that discipline. In fact, I’m a big fan. 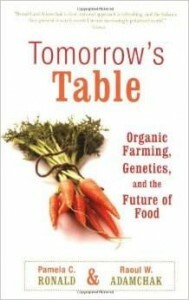 And, because of where I’m based out of I know people who work in and on GMO, and I know their motivations. I can tell you that they sincerely think their research is going to help people. In fact, feed people. 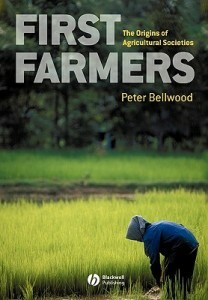 Nevertheless, a common refrain is that objections to GMO have to do with objections to capitalist mass agriculture. The issue isn’t the science of GMO, but big ag. As you know, I don’t buy this. But let’s set that aside. This spring one of the panels at the Biotechnology Literacy Project (BLP) Boot Camp had to do with government regulation of GMO. I was shocked by the greatly increased regulatory hurdles that GMO face in comparison to more traditional techniques (it’s analogous to what gene therapy studies have to go through). * This enormous overhead imposed by regulation means that small operations, in particular academic laboratories, can’t do viable research on GMO that can get funded. Though CRISPR technology opens up myriad possibilities of modification of food plants studied by a few labs here and there, no researcher can devote the resources necessary to jump through all the hoops placed in front of this work. Which type of operations can handle this regulatory straight-jacket? You guessed it: Monsanto. That explains one reason so many mass production crops are GMO. That’s big ag’s bread & butter. So will anti-GMO activists, who are concerned with industrial agriculture, and not the genetic technology, argue for changing the regulations to make academic research more viable and accessible for small and medium sized labs? To my knowledge no one in that community is pushing for this. * If you engage in some Google punditry you’ll encounter documents which suggest that GMO research approval is easier in the USA than elsewhere. This is true. But, from talking to those who work in the field it’s still a big haul for a normal sized laboratory.